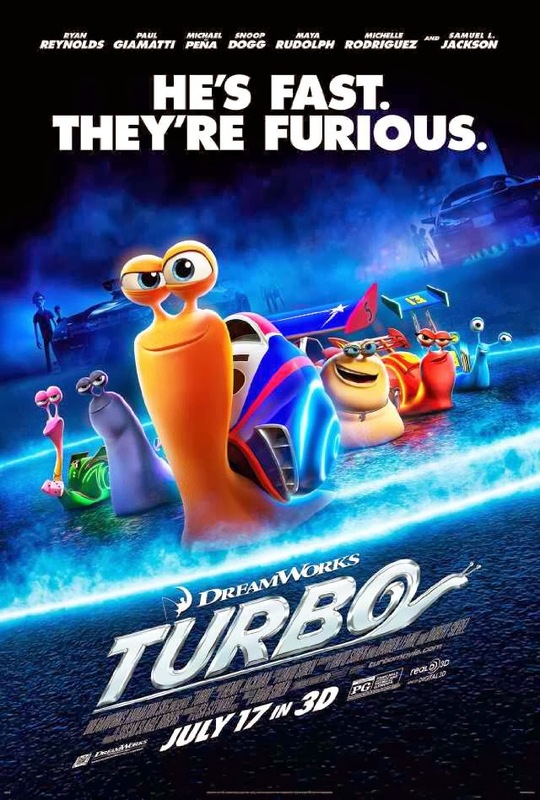 Not being extremely different from any other cartoon, Turbo has its protagonists, who reach the finish and have it all, and the antagonists, who are naturally getting only what they deserve. The good triumphs over evil. The narration is build upon a single person, or, if to be concrete, a small orange garden snail named Theo, who wants everyone to call him Turbo. Droll, endearing and appealing hero and his desperate attempts to make a difference instantly evokes sympathy. He has incredibly bright eyes, in which one can see the determination and the ardor of a dream. In all his naiveté, he is exceptionally touching. The Turbo trailer reveals some of the plot twists and some of the hilarious jokes. The humor of the movie is meant for little children, so it is gentle and a little dumb, but it gives even more charm to the movie. Childishly kind and naive, with a charming character who is impossible not to sympathize with, with a good story at the base, which contains the correct message – Turbo is a perfect combination of traits of a classical animated movie. This is where the actual spirit of a classical animated movie lays – it should be simple, it should be straightforward, it should be heart-warming. All these features and many, many more are hidden behind a simple story about a quick snail. But we all know, what really is behind naïve cartoon characters with no life tragedies and a sonorous name Turbo. There is hidden an actual story of actual pain, actual suffer, actual dedication and actual desperation. In the good old traditions of children’s cartoons, the Turbo movie praises obvious values, emphasizing them and making them as conceivable as possible. There is a big dream, and it shines like a guiding star for a distracted loser who has nothing, besides his dream. For the means of fulfilling this dream, a hopeless loser is willing to make the mountains bend, to walk around the Earth three times and even to obtain hope. The major point of Turbo is that one should never surrender, even in the most desperate attempts to reach the desired, he should go on fighting even more frantically. If you have at least a grain of strength, it should be enough along with faith and the sense of purpose. The image of Turbo develops one of the most important messages an animated child movie should convey – always keep dreaming. The Turbo trailer demonstrates us that Theo is a usual snail, who toils in the garden. Every day, after senseless and boring hours of labor, he returns back home and watches human TV. But there is something deeply unusual in Theo. Theo has a dream, a dream so immense and so irrational, that any law of possibility denies it. He believes and feels that he was born for something more, than his horrid routine. And one day, when he leaves his little garden, stepping beyond in a desperate search, his dream accidentally come true. And now a big road of change, challenges, dreams and hope lies ahead, so he is only welcome to race it. Turbo is a modern animated movie about the most ancient postulates in a yet new form, yet another incarnation, It is bright, colorful, amusing, sweet, and extremely close. Close to us, to the most usual and desperate people with the most unusual and the most desperate dreams.